Receive exclusive stencils and more each month! Check out our tutorials section! 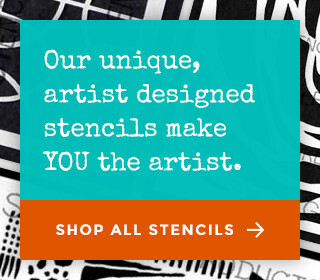 Welcome to StencilGirl Products, your central stop for stencils for artists! Whether you’re experienced with mixed-media or have just started experimenting with unique stencil designs, we have a wide range of stencils perfect for your needs. Our amazing collection includes stencils from various artists, giving you plenty of options for styles and shapes. The options are limitless; use them on any surface you can think of, with paint, fabric, paper, or any other materials. Create your own unique works of art, add some interest to the walls of your home, or even display a new pattern on your clothing. You are only limited by your imagination! These 7 mil mylar decorative stencils are thick enough to be durable and last through countless projects, but thin enough for a seamless look in your art. For ideas, tips and tricks while using your new stencils, check out our Tutorials page! These helpful posts and videos are ideal for beginners or those looking for new inspiration. We also run a Stencil Club, which gets you exclusive, unique stencil designs every month designed by our artists just for club members, plus so much more!